Thank you very much for agreeing to be my first guest of the new year. I appreciate and understand your trepidation, yet you conquered what fears you may have had and gave a great post on a subject that I like very much. Your post gave an even deeper insight into you than I think you share on your own blog’s About page. Thanks for digging a little deeper for us into what makes Te’Kia the writer, who she is. I feel privileged. 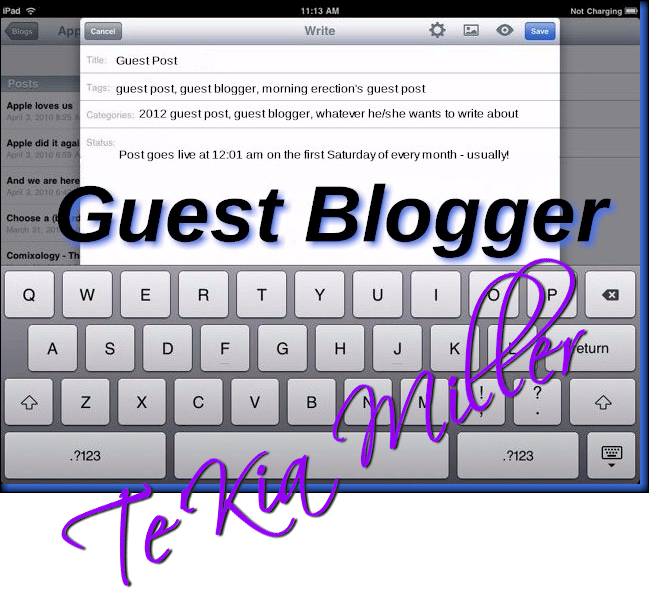 Join me in welcoming my friend Te’Kia Miller from Te’Kia’s Blog to Morning Erection’s monthly staple, Guest Blogger. Te’Kia…. as always, it is a great honor for me to be able to have a guest blogger, especially with the goals and aspirations you have for your own blog. Thank you for taking the time. Readers, as a favor to me please show Te’Kia the courtesy of leaving a comment. Thank you very much. First I would like to thank you Tom for inviting me to be a guest blogger. I must admit I was a little taken aback at the request because being a guest blogger on anyone else’s blog was a far cry from my mind. It was something that never crossed my mind to do or would be asked to do. But, here I am and if I can be honest, I began to worry what I would write about. Luckily I had a few months to think about it. I decided to write about what I know and that is poetry. Poetry is something that grew on me. I never really liked poetry much less admire it when I was young. At a very young age I wrote one poetic piece around Halloween and although it was pretty good, poetry didn’t really resonate with me. Poetry was something of a bore at that time. Then something changed around middle school to high school and I found myself writing poetry almost as if it was something I’d always done. The more I wrote poetry the more it grew on me and I found myself adoring it. I soon began trying to understand it and hone it by taking a poetry class in high school. At that time poetry had fully consumed me and I began to consider myself a poet. I became attracted to Emily Dickerson, Maya Angelou, Langston Hughes, E.E. Cummings, Edgar Allen Poe, a little Countee Cullen and William Wordsworth. I said all of that to say this: poetry is like a butterfly. It is both elusive and submissive, but it is always beautiful and admired. No one said this but this was the thought that crossed my mind at the time of this writing. For me, poetry is a lot of things but I think this is a pretty good summation of poetry. It is such a beautiful, creative art form. Whether you write it as a hobby, a professional or to release your emotions, I think we can all agree that poetry has and continues to show us the power of words. Words can be peaceful, furious, good, bad, evoke emotion, or tear down emotion. Now the words, phrasing and arrangement although creates beauty it can also cause poetry to be elusive to some. It was for me at first. For some individuals poetry may seem to go beyond their understanding. They may not catch on to the metaphor or the analogy of a particular piece. I’m not saying that to be hoity-toity or as an insult to anyone. It’s just that in my personal experience and interactions with others, some people get it and others don’t. For those who feel or think poetry speaks to a deeper understanding than what they’re accustomed to, poetry is elusive. That doesn’t mean they don’t or can’t admire its beauty. Then there are those who catch poetry in their palms. There it becomes submissive, taking rest and unafraid. Here the catcher and poetry become acquainted with one another and there is an understanding that takes place. For writers of poetry I think there is an intimate understanding as well as for readers of poetry. Whether an occasional reader or writer, whether a heavy reader or writer of the art, its beauty is continually admired by most who come in contact with it. What about you? What has been your experience with poetry? Are you a reader or writer of poetry? Are you a fan of the art form or not so much? What are your thoughts? You are currently browsing the archives for the Te’Kia Miller category.